This is the moment a police van inadvertently held up a courier vehicle that was delivering emergency medicine. Dashcam footage recorded in London by lorry driver Alan Crosby shows the blue delivery van attempt to merge with traffic as the road splits. Seeing the potential queue jumper, the police van blocks the Courier Network Systems van, preventing him from pulling off the main road. As the delivery driver inches forward in an attempt to merge, so too does the police vehicle. Crosby can be heard laughing as he witnesses the situation. After eventually realising the police weren't going to let them in, the delivery driver diverts their course and carries on down the main road. It was later revealed that the blue van was transporting medication that had an incredibly limited lifespan. A Courier Network Systems spokesperson told the Mirror: "Our vehicle was carrying patient medication, which is only effective for a short time, after which it is deemed useless. "It was, therefore, imperative that the material be delivered to its intended destination in the shortest possible time. "Our driver was completing his duties to the best of his ability and certainly was not committing any traffic offences. He explained to the police officer that he was transporting urgently-needed medication. "The manoeuvre caused our vehicle to lose valuable time as it was diverted." 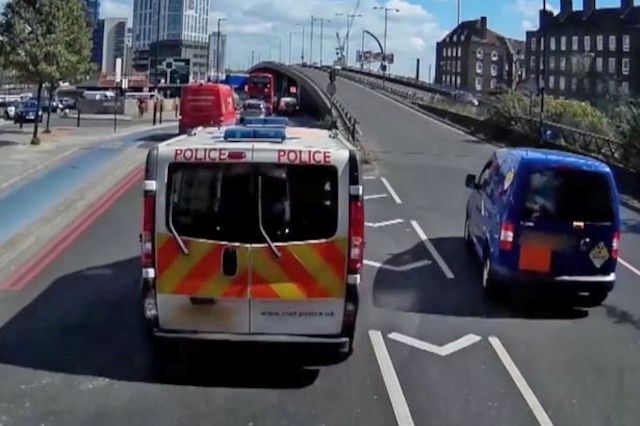 The Metropolitan Police responded: "Of course the officers would have been completely unaware of what was being transported by this courier company. "There are recognised couriers, who for example transport blood urgently around London, that police are well aware of and interact with. "Any driver carrying out a risky manoeuvre should expect the police to pay attention to their driving as risky manoeuvres are one of the five identified top risk factors that are present in over 70 per cent of all serious or fatal collisions in London."